We are Tony and Steph Kageni; together we have over 25 years of experience in the safari industry to share with you. Tony now runs our safaris and will be your guide throughout your stay with us.Â Steph runs the office and logistics and will be your direct contact; although she does manage to escape on safari once in a while and may join you, along with Joe, of course! We believe that because we are a Kenyan/British company we offer the best combination of both in-depth local knowledge and the dedication and understanding to fulfil every client's individual needs. With our experience in the travel industry and our intimate knowledge of East Africa's geography and culture let us take you on the adventure of a lifetime. Let us show you the stunning scenery, diverse cultures and rich wildlife that make Kenya and East Africa the perfect safari location, a safari you will treasure forever, a journey you have only ever dreamed of. Travel with Safari Joe and your African Safari will be an amazing and unforgettable travel experience! Kenyan-born Tony trained as a guide in Kenya's Masai Mara and throughout his career has explored this magical continent; along the way sharing his knowledge and enthusiasm with all. Tony is an award winning Safari Guide and recently ranked in the top 30 guides globally on TourHQ. British-born Steph has been an overland expedition leader since the year 2000 when she fell in love with Africa and Tony and the rest they say is history! Together they make an unbeatable team. Steph now runs the office and will be your point of contact, she also packs a great picnic for their day trips! 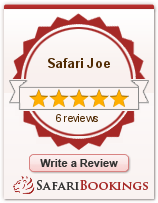 Joe is our son whom the safari company is named after as an embodiment of our partnership. Joe has a love for people, wildlife, camping and the great outdoors of Africa. Safari Joe has lived in Kenya since he was two and regularly joins us on our safaris and expeditions throughout East Africa. She is an experienced website developer and online marketer who is very creative. We have been working with her ever since we launched our business. She is a great advisor when it comes to Online Stuff.